Background: Changes in demography will lead to an increasing number of elderly people with multimorbidity and an increase in the need for specialized palliative care at home. This is a challenge in particular in rural areas with long physical distances. The use of telemedicine could provide access to specialized palliative care teams (SPCTs) for a higher number of patients without need for allocating further resources. So far there is a lack of the patients and relatives views on the use of telemedicine in palliative care. Methods: Pilot-telephone interviews of patients and relatives about their views on telemedicine and palliative care in rural areas shall be performed. During a one-year study period telemedicine will be implemented building on a “bring your own device” (BYOD) approach in the provision of specialized palliative care in rural Southern Jutland. The views and practical experiences of the different stakeholders on the use of telemedicine in palliative care (patients, relatives and health-care workers) will be explored using qualitative research with in-depth interviews and focus group discussions. In addition quantitative data from the patient records and the Danish Palliative Care Database shall provide insight in the usefulness of telemedicine for relieving distressing symptoms, the satisfaction of both patient and relatives, the potential to reduce the need for hospital admission and the potential to increase effective care provision at home. Discussion: This study will provide new insights in the use of telemedicine in palliative care from the perspectives of all involved stakeholders. It will expand our knowledge of the user perspective and might therefore contribute to the future implementation of telemedicine with respect for the stakeholder’s needs and views. Registration: The study has been reported to the regional Danish ethics committee (S-20172000-119) and the Danish Data Protection Agency (2008-58-0035). The demographic development and the increasing life expectancy will lead to an increase of the number of people suffering from chronic diseases, multimorbidity, dementia and frailty [1-3]. Many people want to die at home  and in recent years it has been shown that 66% of Germans and 55% of Danes would prefer to die at home [5, 6]. However in the recent years, only 20% of deaths in Germany, 17% in Denmark and 15% in Norway [5-7] occurred at home. Beside breathlessness and nausea one important barrier for death at home is the lack of relatives who are involved in care for the dying person . An organized cooperation between the health care service and the patients’ relatives therefore seems to be an essential factor to increase the likelihood of home death. Health services worldwide have to prepare for the future care of many people with complex health problems and an increasing need for assistance and palliative care at home or in nursing homes. Probably a combination of basic education in palliative care for all citizens with Last Aid courses  and telemedicine could support patients and empower relatives to provide palliative care at home and thus enable more people to die at home . .“The delivery of health care services, where distance is a critical factor, by all health care professionals using information and communication technologies for the exchange of valid information for diagnosis, treatment and prevention of disease and injuries, research and evaluation, and for the continuing education of health care providers, all in the interests of advancing the health of individuals and their communities”. In rural regions specialized palliative care teams (SPCTs) often cover large areas and spend long time driving when visiting the patients in their own homes. Due to these geographical challenges and limited resources home visits by SPCTs are restricted. In order to meet the increasing number of patients who will need specialized palliative care at home telemedicine and telehealth options have been suggested as measures to ease these problems [13-15]. Findings from Scotland have shown that both patients and carers appreciate telehealth as an adjunct to clinical care . Members of Danish SPCTs state that telecommunication has an “added communicative value” but remind us that telecommunication can not replace face-to-face communication and home visits totally . So far there is limited scientific evidence for the use of telemedicine and telehealth in palliative care at home . Nevertheless the provision of specialized palliative care at home is both wanted and needed for many people and may contribute to avoid unwanted hospitalization at the end of life. More knowledge about the impact of telemedicine on palliative care in rural regions is needed. The views of the stakeholders and especially of the patients and their relatives are so far neglected by previous research. To explore the patients and their relatives view on telemedicine and palliative care is therefore paramount. This report presents the protocol of the study that will be used for data collection from 2017 - 2019. The main aims of this study are to investigate the impact of telemedicine on the care of palliative patients and the views of the different stakeholders. •	To investigate if telemedicine can improve communication, education and cooperation between specialized palliative care teams and primary health professionals. •	To explore the stakeholders views on the implementation process of telemedicine in different areas with different cooperation partners from primary care and a variety of pre-existing technical systems. Steering Group: The project is part of a bigger regional project named `Gøre det lettere at nå hinanden´ (To make it easier to reach one another) that is initiated and funded by the region of South Denmark . The steering group of this project is referring to the four municipal directors and the two hospital directors for the somatic and psychiatric hospitals of South Jutland. Project group: The project group for the project includes representatives from the four municipalities served by the South Jutland Hospital: Aabenraa, Haderslev, Sønderborg and Tønder, the project team from the Medical Department Sønderborg/Tønder, South Jutland Hospital and CoLab South Jutland. The practical work within the project is divided into four working groups: the IT-working group is responsible for the technical equipment, communication devices and software; the communication working group shall inform all stakeholders in the community about the project; the pilot testing working group will test the equipment and practical use of the communication settings prior to the study; the evaluation working group will work with the scientific evaluation of the project. 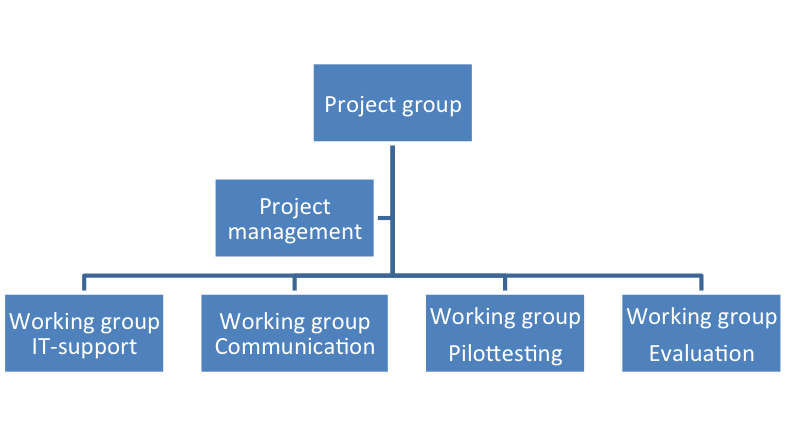 The organization of the project group is shown in fig. 1. Collaborating organizations: In addition to the above mentioned partners represented in the project group the home care services of the municipalities and local general practitioners will participate in the project. The study will be performed in South Jutland, a Danish region with a size of 3.939 km2 and 227.754 inhabitants. The region is served by the SPCT of the South Jutland Hospital . Visiting a patient may in some cases include a two-hour drive plus time for the consultation in the patients’ home (usually at least one hour) and additional paperwork, thus resulting in a time-need of up to four hours for a first visit of one patient. At present the SPCT of the South Jutland Hospital has three physicians, four nurses, two physiotherapists, a social worker, two psychologists, a secretary and a chaplain (some part-time positions). One of the physicians serves on weekdays the Hospice in Haderslev with 12 beds. The hospice is a half-our drive away from the base of the SPCT in the hospital in Sønderborg. Due to geographical challenges and restricted resources, home visits by SPCTs are therefore limited. For palliative cancer patients who need acute help and care in a hospital, a palliative care ward of the South Jutland Hospital has 12 beds for palliative patients. The study population includes patients (and their relatives) who are connected both to the SPCT and the palliative care ward of South Jutland Hospital in Sønderborg. Patients included in the study have to be in need for specialized palliative care at home. In addition health care workers who have been engaged in telemedicine consultations using video communication within the project shall be included as informants. Patients and relatives who are already connected to the SPCT of South Jutland Hospital and who have an “open admission” to the palliative care ward of South Jutland Hospital in Sønderborg. They will be asked to participate in a short semi-structured interview about their views on the use of telemedicine in palliative care for their future care in connection to already scheduled consultations or telephone consultations with the SPCT. The participation in part 1 of the study will include a one-time interview only. The interview will take place via telephone or face-to-face. The interview guide for the interviews is shown in table 1. Do you have a personal computer with camera/microphone or a tablet with internet-connection in your home? Would you like to participate in video communication with a doctor and nurse instead of speaking to them via telephone? Do you think video communication could be advantageous than using a telephone for communication? Would you like to participate in video communication with the palliative care team and others (for example with your primary care nurses, your general practitioner, relatives who live far away or others involved)? Patients (and their respective relatives) who receive care at home by the SPCT of South Jutland Hospital and at the same time are registered to have an “open admission” to the palliative care ward of South Jutland Hospital in Sønderborg will be invited to participate in an implementation of telemedicine to support their care. Within a one-year study period it is planned to include more than 20 patients who shall receive follow-up care mostly based on telemedicine and video communication. •	The patient’s home has connection to the Internet. Patients will be recruited in connection to consultations with the SPCT. All participants will be informed that participation is voluntarily and that they can withdraw from the study at any time without the need to provide a reason for withdrawing and without consequences for them or their relatives. Participants for the pilot-telephone interviews (part 2) will be informed about the study by phone. They will receive oral information with the possibility to receive either written information before a telephone interview or oral consent prior to the one-time short telephone interview. Patients, relatives and health-care personnel who participate in parts 3 and 4 shall receive written information about the project and written informed consent will be obtained. Written permission will be documented to access the patient’s data in the electronic patient chart and the Danish database for Palliative Care. Participation in teleconsultations may be both reassuring and burdensome for palliative patients. Therefore the patients (and their relatives) may always cancel their participation in the study without the need to inform the study team about the reason for doing so. The SPCT will assess the patient’s physical and mental capacity to participate in teleconsultations frequently within the study period and may exclude a patient due to deterioration of his/her condition in order to protect the patient to experience participation in the research project as a burden. The study protocol has been reported to the Regional Ethics committee (S-20172000) and was approved without the need for further documentation or assessment by the regional ethics committee. It has also been reported to the Danish Data Protection Agency and received permission to proceed (2008-58-0035). All participants will receive oral/written information about the study and will have to give informed consent before their participation. After inclusion in the study an internet-based video communication will be established in the patient’s home. The equipment in the patient’s home will be based on the patient’s own device with secure software to be installed. Patients without the needed hardware (personal computer or tablet computer) will have the opportunity to loan a tablet computer from SPCT for the trial period. The SPCT and the palliative care ward in the hospital in Sønderborg will use existing computer systems and the patients/relatives will use their own devices (Bring your own device - BYOD) if feasible. •	It will be used for follow-up care, modification of the actual therapy, etc. •	Advice for the primary care nurse, modification of the actual therapy, etc. In a mixed methods approach qualitative and quantitative data are combined in order to provide a richer picture of the topic [20-25]. Patient-related data will include information about the patient’s disease from his chart and routine data connected to the patient from the Danish Palliative Care database. The collection of the qualitative data will be based on well-identified and described methods and include both in-depth-interviews and focus group interviews [23-28]. Qualitative data for part 2 will be written notes from the interviews. Qualitative data for part 3 and 4 will be collected during in-depth interviews of patients and focus group discussions of relatives and health-care personnel. The interview guide for the interviews shall be semi-structured with some introductory questions and open follow-up questions on the informant’s answers. The guide will be based on the results from part 1 and 2 of the study and will therefore first be developed in the course of the study. All interviews from part 3 and 4 will be recorded digitally. Data will be kept on a secure server that is only accessible for scientific personal connected to the study. Personal data will be deleted after the study is finished and the results are published. Qualitative data will be analyzed using Qualitative description [26-28]. The reporting of the qualitative data shall be performed according to the COREQ guidelines . Quantitative data from the patient charts and the Danish Palliative care database will be analyzed and presented by descriptive statistics. This study investigates the views and opinions of the different stakeholders on the use of telemedicine within the field of palliative care. So far there is a lack of knowledge about the views of those most concerned: the patients themselves and their relatives. Therefore research aiming to explore their perspectives is urgently needed. Our study will provide a picture of the views of all stakeholders including patients, relatives and health-care workers from both primary care and specialized palliative care. We will aim to prove if telemedicine may increase the quality of care from the stakeholder’s perspective. Furthermore the potential to safe both time and costs by using telemedicine in the provision of Palliative care in rural areas will be explored. A challenge of the study will be to decide from what point in the study the patients will not benefit from participation in telemedicine any more. Another challenge will be the inclusion of already existing different types of technical solutions for video communication in the four participating communities. Therefore the study will support the collection of experience with cooperation using different means of communication. An important ethical aspect of the study is the inclusion of vulnerable palliative patients. Many people argue that these patients should be excluded from research in order to protect them. In contrast to that many palliative patients want to help others and find it meaningful to participate in research projects . Another aspect is to include the views of vulnerable people in both scientific and public discussions. Therefore, it is important to include vulnerable patients in research projects to give them a voice [32, 33]. A more detailed description of management and organizational aspects and the challenges of the implementation process of the project have been described in Brinks master thesis . In conclusion the planned study will provide new insights in the use and implementation of telemedicine in palliative care from the perspectives of all involved stakeholders. It will expand our knowledge of the user perspective from various angles and might therefore contribute to the future implementation of telemedicine with respect for the stakeholder’s needs and views. The project is funded by grants from the region of Southern Jutland and Colab Sønderjylland and receives financial support from South Jutland Hospital and the four municipalities Aabenraa, Haderslev, Sønderborg and Tønder. GB, AB, HAS and KHB contributed to the development and design of the study protocol. All authors have read the study protocol critically and contributed with input for improvement and adaptations. All authors have read and approved the final manuscript. Drs. Jeremy C. Keen and Frans Brandt recommend publication of this article. Kolb GF, Weissbach L. Demografischer Wandel - Veränderungen in Gesellschaft und Medizin und Entwicklungstendenzen in der Geriatrie. (Demographic change: Changes in society and medicine and developmental trends in geritrics.) Urologe. A 2015;54(12):1701-1709. Chrismon spezial 2014. http://static.evangelisch.de/get/?daid=jwhRNMB8FaGErjJle8tHi0fL00081222&dfid=download Accessed 22 Sept 2017. PAVI. Hvor dør vi? http://www.pavi.dk/borger/doedentaetpaa/doedentaetpaa_hvor.aspx Accessed 22 Sept 2017. Statistisk sentralbyrå. Dødsfall etter dødssted. 2012. https://www.ssb.no/statistikkbanken/SelectVarVal/Define.asp?MainTable=Dodssted&KortNavnWeb=dodsarsak&PLanguage=0&checked=true Accessed 22 Sept 2017. Kern M et al. Ambulante Palliativbetreuung – Einflussfaktoren auf eine stationäre Einweisung am Lebensende. Z Palliativmed. 2007;8:155-161. Bollig G, Heller A. The last aid course - a simple and effective concept to teach the public about palliative care and to enhance the public discussion about death and dying. Austin Palliat Care. 2016;1(2):1010. Bollig G. The Last Aid course – an approach to promoting public discussion, awareness and education. Invited lecture. Conference of the Scottish Partnership for Palliative Care ”Making the Best of Hard Times” Edinburgh, September 2017 https://www.palliativecarescotland.org.uk/content/annual-conference-2017/ Accessed 22 Sept 2017. World Health Organization. WHO Definition of Palliative Care. http://www.who.int/cancer/palliative/definition/en/ Accessed 22 Sept 2017. World Health Organization. Telemedicine: opportunities and developments in Member States: report on the second global survey on eHealth 2009. http://www.who.int/goe/publications/goe_telemedicine_2010.pdf Accessed 22 Sept 2017. Dansk Palliativ Database (DPD). http://www.dmcgpal.dk/373/dansk-palliativ-database-(dpd) Accessed 22 Sept 2017. Region South Denmark. Tværsektorielt tele-dialogisk projekt, `Gøre det lettere at nå hinanden´. https://www.google.co.uk/search?client=firefox-b&dcr=0&q=Tværsektorielt+tele-dialogisk+projekt%2C+%60Gøre+det+lettere+at+nå+hinanden´.&oq=Tværsektorielt+tele-dialogisk+projekt%2C+%60Gøre+det+lettere+at+nå+hinanden´.&gs_l=psy-ab.3...5035.5035.0.5444.1.1.0.0.0.0.101.101.0j1.1.0....0...1.1.64.psy-ab..0.0.0....0.0dlX4A6-WZA Accessed 22 Sept 2017. Bollig G, Schemmel KW, Bachmann K. The Palliative Care Team of Southern Jutland - A Model of Good Practice for Specialized Palliative Care in Rural Regions? Abstract 15th EAPC World Congress Madrid 2017. O´Cathain A, Thomas K. Combining qualitative and quantitative methods. In: Pope C and Mays N. Qualitative Research in Health Care. 3rd ed. Oxford: Blackwell Publishing, 2006, pp. 102-111. Pope C, Mays N (eds.). Qualitative Research in Health Care, 3rd ed. Oxford: Blackwell Publishing, 2006. Kvale S. InterViews. London: SAGE Publications, 1996. Krueger RA, Casey MA. Focus groups – A practical guide for applied research. 4th ed Los Angeles: SAGE, 2009. Malterud K. Kvalitative metoder i medisinsk forskning. 3rd ed. (Qualitative methods in medical research). Oslo: Universitetsforlaget, 2011. DANISH EORTC QLQ-C15-PAL https://www.sundhed.dk/content/cms/46/92646_eortc_-_dansk.pdf Accessed 22 Sept 2017. Addington-Hall JM. Introduction. In: Addington-Hall JM, Bruera E, Higginson IJ, Payne S (eds.). Research Methods in Palliative Care. Oxford: Oxford University Press, 2007: 1-9. Rogers AE, Addington-Hall JM. Palliative care research in the face of uncertainty. In: Beattie J, Goodlin S (eds.). Supportive Care in Heart Failure. Oxford: Oxford University Press, 2008: 463-475. Bollig G, Rosland JH, Gjengedal E. Etiske og juridiske dimensjoner av forskning på sykehjem. (Ethical and legal dimensions of research in the nursing home). Omsorg. 2013;1:51-55. Brink A. Management of development project: “Telemedicine solution for home visits in palliative care – a cross-sectoral pilot project”. Master thesis University of Southern Denmark (Danish); 2017.